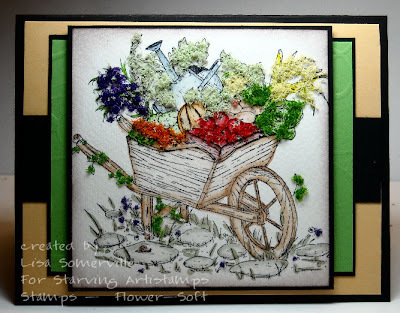 I've finally gotten around to finishing the last series in the Flower Soft Wheelbarrow Cards. I sent off the series of Wheelbarrow Flower Soft cards to Tracey last week, so she'd have them for her displays at shows. If you attend a show and Starving Artistamps is there, you'll be able to see them up close! This card uses the Autumn Harvest images from the Wheelbarrow set. As with my other cards, I colored my image first using the Marker Watecoloring Technique before I applied the Flower Soft. I ran the green panel through my Big Shot using my Texturz Plates, and popped the main panel on dimensionals. It makes one want to reach out and touch it, so life life! Super duper rockin' art! again: WOOOOOOOOOOOW! WOW! So PRETTY! !